This is a tiny Rogz for Dogz Adjustable H-Harness in their Alpinist Soft Webbing. It features four different adjustment points, including the strap between the front legs. This harness is available in ten different colors and four sizes to fit dogs with chests 9-39" around. The Company also offers the harness in a variety of other webbing materials, colors, and patterns. This is a basic Roman-style harness, which is my favorite design. It stays in place while sitting well clear of the shoulders, upper arms, and armpits. I'm fond of the Rogz for Dogz company because so much of their equipment seems overbuilt. You want a collar? Here's one with a reinforced buckle that can actually lock shut. They offer bright colors and designs that hold up reasonably well, though the prettiness will be gone eons before the gear itself begins to wear out. Pros: Basic harness with light hardware. Ring on the front means it can be used as a front attachment harness. Cons: Single buckle means dog must step right leg over the girth strap before it can be buckled. May have issues loosening up over time. 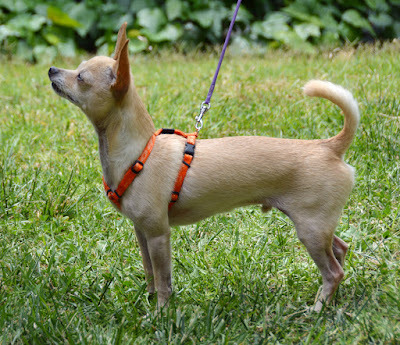 Bottom Line: This is a durable everyday harness that is widely available around the world.